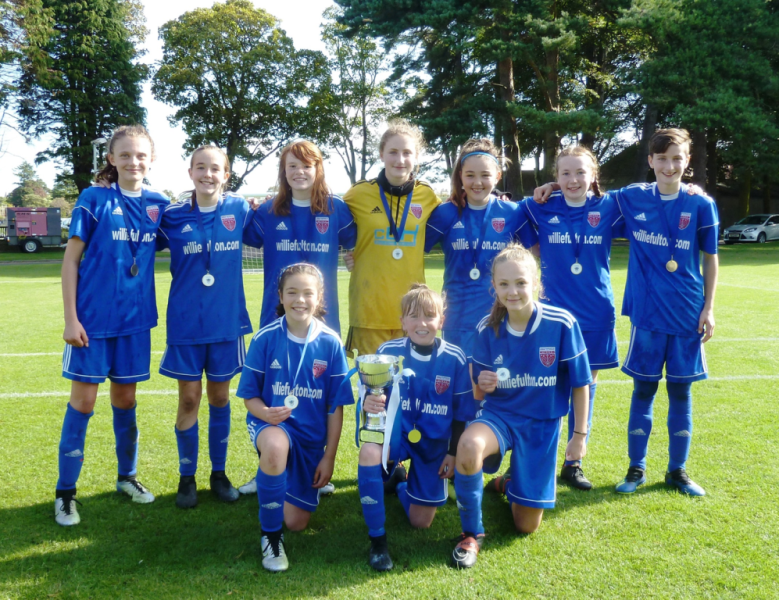 A magnificent performance from our U13s secured the East Region League Cup at a sunny St Andrews on Saturday. Forfar started the game brightly & attacked from the off. Martyna Kisiel opened the scoring on 5 minutes when sent through the middle she calmly rounded the keeper to slot home. Inverkeithing drew level in the 12th minute when a corner was only half cleared, the midfielder scoring with a good finish from the middle of the box. Forfar restored their advantage before half time with a cracking individual goal. Lily Christie picked the ball up on the half way line beating a couple of players before scoring into the far corner off the post. Forfar continued to press after the break & there lead was extended with a move straight from the training ground. A corner from Brodie Greenwood was volleyed home by Eilidh McDiarmid. Forfar were now controlling the game and they added a fourth when a brilliant cross field pass from Alix Saddler found Vivian Kerr at the edge of the box. Vivian controlled it first time and her right footed shot found the far corner. Another Greenwood corner was unfortunately turned into the net by an Inverkeithing defender to finish the scoring.